Highland Terrace Elementary presents an evening with educational consultant, Aidan Key, on Tuesday April 9, 2019 from 6:30 to 8pm in the Highland Terrace cafeteria. 100 N 160th St, Shoreline 98133. 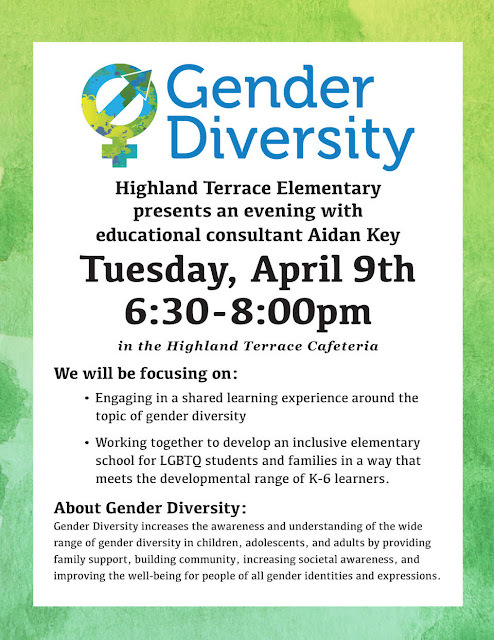 Aidan Key is the founder of Gender Diversity, an organization working to increase the awareness and understanding of the wide range of gender diversity in children, adolescents, and adults by providing family support, building community, increasing societal awareness, and improving the well-being for people of all gender identities and expressions. Diversity? it's not hard. There are two. Boys and Girls. You are one and not the other.